The storm destruction of the railway line connecting Devon and Cornwall to the rest of the UK will cost the South West economy millions of pounds each day, business leaders have claimed. Network Rail said the line, which is hanging in mid-air, will take a minimum of six weeks to repair. 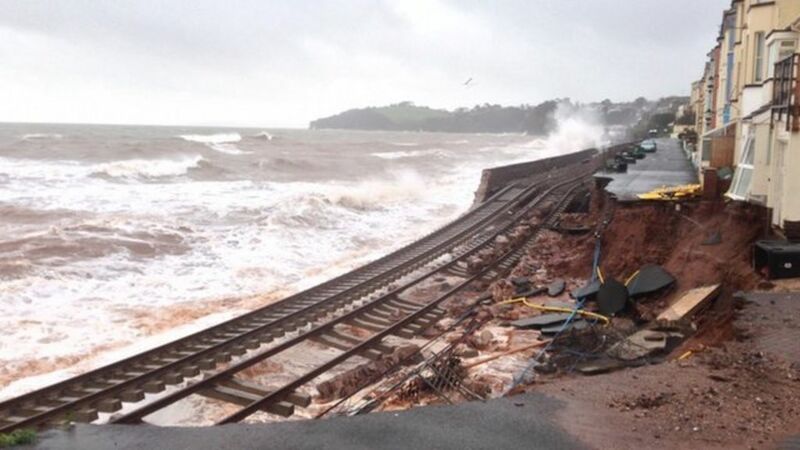 The storm destruction of the railway line connecting Devon and Cornwall to the rest of the UK will cost the South West economy millions of pounds a day, it is claimed. Looking west from the station footbridge at Dawlish on 12 September 2011. A Class 50 entering Dawlish with a Paignton - Waterloo service in December 1985. A Western diesel-hydraulic photographed leaving Dawlish in August 1975.